Sally Mann is known for her collection of photographs Immediate Family, which shows her children at their rural family home in Lexington, Virginia. Since the publication of that book, she has done mainly landscapes near her home, photographs of her husband Larry, who has a rare form of muscular dystrophy, and photographs of decaying bodies, including humans at the Tennessee Body Farm and her own pet dog. Filmmaker Steven Cantor spent a great deal of time with the Mann family, and also includes parts of his earlier documentary about Mann filmed at the time she was taking the pictures of her children when they were young. 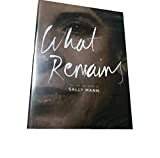 Obviously the focus of the film is Sally Mann, but we see her in interaction with her mother, husband and children, and talking about her father, who faced his own death with great equanimity. We also see her just at the time when the New York commercial art gallery that had agreed to show her new photographs changed its mind and cancelled her show; this is a major personal blow to her at first, and we see her coping the news. For someone who spends most of her time in her own personal world, separated from the New York art world, it means she may be even more isolated than she had realized, and she will not get the recognition she had been expecting. She soon bounces back with an exhibition in Washington DC at the Corcoran. What makes Mann's photography so compelling is its personal nature, so it helps a great deal to get a sense of Mann's personality, her major preoccupations, and her relationship with her family. We also see her taking her photographs with her large format camera which requires exposure times of several minutes. The developing process is fragile and pictures are easily lost. The documentary gives a strong sense of her individuality, and her unusual readiness to pursue ideas that other people are uncomfortable with. Her marriage seems to be strong, and her love of her children is powerful. She seems peculiarly determined to pursue her projects, and this heightens the sense of her idiosyncratic character. Her photographs are beautiful; her current work often relies on the imperfections of the old process using glass plates, introducing many unintended patterns or shadows, and the ones she chooses to keep enhance the images both aesthetically and conceptually, with their randomness and obvious signs of decay. These help to balance the obvious romanticism and idealization that might otherwise come with her images. The DVD has several extras, including deleted scenes, some parts of a lecture Mann gave, and Cantor's previous short documentary about Mann, Blood Ties. This is an excellent product that will be informative to anyone wanting to better appreciate Mann's work.